Improving. Getting better. Becoming the best. Other than a few members of Congress, most people naturally aspire to continually improve themselves, their surroundings and their effectiveness. Although exceptions most likely exist, the criminal investigators I know jump at the chance to increase their crime solving skills through study, training and hard work, and they definitely take advantage of any tool they can leverage to gain even more benefit. 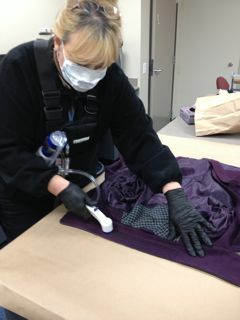 Regardless of the type of tool, if it will help solve a crime, investigators want it used in their case. DNA profiling is one tool that has become critical in its application, and by improving the strength and discrimination of a DNA profile, the value to a case increases exponentially. Is that a bold statement? You bet it is. But one I believe can be backed up with data and now casework. Let’s take a look. Several years ago we took the M-Vac System to a private DNA lab and asked them to test the viability of using the M-Vac to collect DNA material from evidentiary surfaces. When the lab presented the results to us, they essentially told us they had never seen DNA collection results like what they had seen from the M-Vac. When the lab told us the M-Vac had collected up to 200X more than the swabbing method in sampling saliva from cotton, we knew the M-Vac could be a special tool in the forensics industry. Despite those impressive results, however, members of the forensics community wanted more data points, so we approached Boston University, UC Davis and others to conduct validation studies. In comparisons to the swabbing and taping methods, M-Vac results averaged around 20-30X better. Results vary depending on the substrate and the target DNA material, but even in a touch DNA comparison where the M-Vac was only 5X more effective, more often than not more stable profiles were generated – which is what really matters. At the same time, a number of actual cases that had either gone cold or had stalled out were identified as good M-Vac candidates and the lab that had done the original M-Vac’s validation used the system on several pieces of evidence in those cases. In one particular case, sufficient DNA was collected to generate a profile from a pair of underwear that had been submerged in water for 8-10 hours. In another, a full DNA profile was collected off a rock that had sat in an evidence room for 18 years. Various clothing items, rope, brick, cement blocks, and other substrates have all yielded up DNA profiles to the M-Vac System, despite being rough, porous and resistant to other collection methods. As the M-Vac is used more frequently, it is also being used in more diverse ways. To date we know of several cases where a suspect was exonerated due to the DNA results obtained by the M-Vac System. In one such case, a man was accused of sexually assaulting a teenage girl. The swabbing method essentially yielded no actionable DNA results from the girls underwear. However, once the M-Vac was utilized, collecting from the same areas the swab had failed, DNA profiles were produced, but not of the man the girl was accusing. Investigators were able to take the results to the victim and get the real story, which led the investigation to the right suspects and cleared the innocent. We consider that outcome just as much of a win as helping convict the guilty! Solving crime is a complicated process in today’s society. Long gone are the days where one investigator can walk onto a crime scene, review the evidence, talk to a few people and then put the puzzle together. In today’s world, investigators must often utilize new scientific techniques, look for evidence that cannot be seen by the naked eye, restructure the crime scene using video and 3D technologies, they must begin preparing for the possibility of a trial from the moment they are alerted that there needs to be an investigation, ensure every type of expert from fingerprinting to child psychology is involved where needed and a myriad of other things. And certainly DNA collection and processing is one of the centerpieces of the puzzle. Fortunately for many crimes, the M-Vac System is becoming more and more well known and accessible so investigators can effectively utilize it when the case calls for it. The bottom line? The investigators that have an M-Vac available to them are solving crimes that they otherwise couldn’t, and that’s a good thing. To learn more about the M-Vac System click here. By mvacjb2014 in Uncategorized on July 19, 2016 .